The Krishna district administration has intensified efforts to shift the Swarajya Maidan Rytu Bazaar to Ryvas canal bund near Alankar theatre at the earliest. 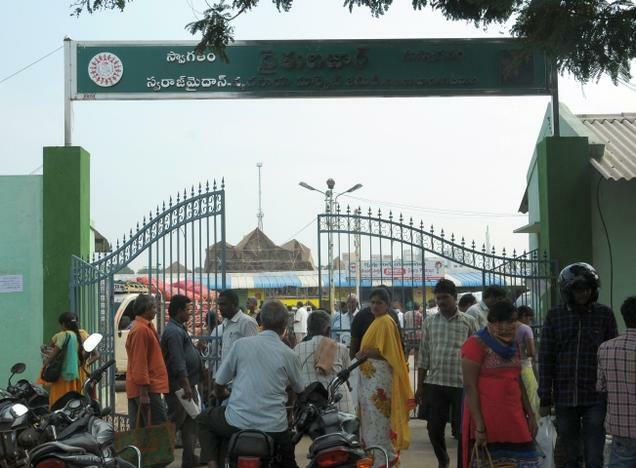 The Swarajya Maidan Rytu Bazaar is the biggest Rytu Bazaar in Vijayawada with 325 shops and located very close to the camp office of the Chief Minister, N Chandrababu Naidu. More than 10,000 people visit the Rytu Bazaar every day as it is located in the heart of the city. Now, the officials have firmly decided to shift the Rytu Bazaar to other location near Alankar theatre. The District Collector, Babu and other officials inspected the Ryves canal bund near Alankar theatre on Saturday to shift the Rytu Bazaar at the earliest. The Collector has asked the marketing department officials to take steps for construction of Rytu Bazaar. He asked the Transco officials to shift the proposed sub-station at the Alankar theatre to other place as the venue on the canal bund will be used for staging dharnas. The officials are planning to construct the Rytu Bazaar from Alankar theatre to Vijaya talkies bridge along the Ryves canal bund. The Collector asked the officials to take up the beautification of canal bund up to Kotta Vantena (bridge). The canal bund has been neglected for along time.